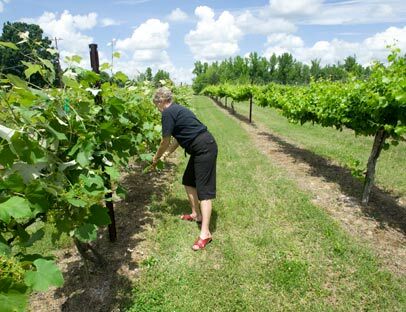 North Carolina’s burgeoning wine industry is ripe with economic impact. And strengthening the industry’s business roots will allow it to flourish even more. That’s where researchers from UNCG and N.C. A&T have stepped in. Two years ago, faculty from Greensboro’s two public research universities teamed up to examine the growth of North Carolina’s nascent grape and wine industry and ways the business side of vintage production can be strengthened. Their results, published earlier this year, identified an industry that’s already making an impact on North Carolina’s economy and has the potential to be a key crop as the trade develops and matures. A bottle of wine sold is a lot more than just one bottle. The wine industry has a history of being a job creator, producing economic waves that ripple through other business areas, including transportation, retailing and tourism. The number of wineries in the state has grown from 35 to 85 since 2004; experts expect the number to top 100 by the end of the decade. A 2006 study showed the industry had created 5,700 related jobs and had a total economic impact of $813 million. And grapes have been identified as the cash crop that may offset the declining economic role of tobacco in the state. But struggles on the business side can hinder wineries and the growth of the industry. “If you look at it from the standpoint of a business, they are mini-conglomerates,” said Samuel Troy, the Bryan School’s executive-in-residence. Winery owners are in charge of growing the raw materials, making and selling the wine, self-distributing and cross-marketing their products, he said. The researchers’ report also identified an overall need for better education and marketing to promote North Carolina’s locally produced, hand-crafted vintage, as well as areas of opportunity, such as the state’s need for more grapes than are currently being produced. The team is already compiling information to address one of the findings, conducting a benchmark study on the state’s alcohol regulations and how they compare to other states’. “Part of the concept that they’ve brought forth is to assist smaller wineries and vineyards with understanding basic business practices, providing some resources from the business school in order to help them generate or improve their business plan and educating the industry in supply chain partnerships,” said Margo Knight Metzger, executive director of the N.C. Wine & Grape Council.